If you’re interested, please contact MinhChau Nguyen (Loan Manager) at (408) 532-1278 x 201 or mchau@pacificwide.com for more information. For many retirees, a reverse mortgage--or HECM--is the most effective way to turn a home equity into increased income. The benefits are numerous. Homeowner continues to live in and own the home. You do need to pay property insurance and taxes, and basic home maintenance during loan period. The money is tax-free and does not affect Social Security or Medicare. We recommend that you consult your financial advisor. There are no income, health, or credit qualifications. A credit report may be used to check any federal tax liens or other items present that may affect qualification. A reverse mortgage is a type of loan that allows homeowners age 62 and older to convert a portion of the equity in their home into cash, while they continue to live in and own their home. Unlike a traditional mortgage or home equity loan, no monthly mortgage payment is required. The borrowers must maintain the property as their primary residence, and remain current on property taxes and required insurance. The loan becomes due when the last surviving borrower no longer lives in the home as their principal residence, or the home is sold. Yes. As with any mortgage, you retain ownership of the home and can continue to live in it as long as you want, as long as the terms of the loan are met. Do I have to own my home free-and-clear to qualify? Not necessarily. If you currently have a traditional mortgage and/or a home equity loan, the amount of your reverse mortgage loan proceeds will depend on the size of your remaining mortgage(s) and your home’s value. The less you owe on your home, the more likely you’ll qualify for a reverse mortgage. 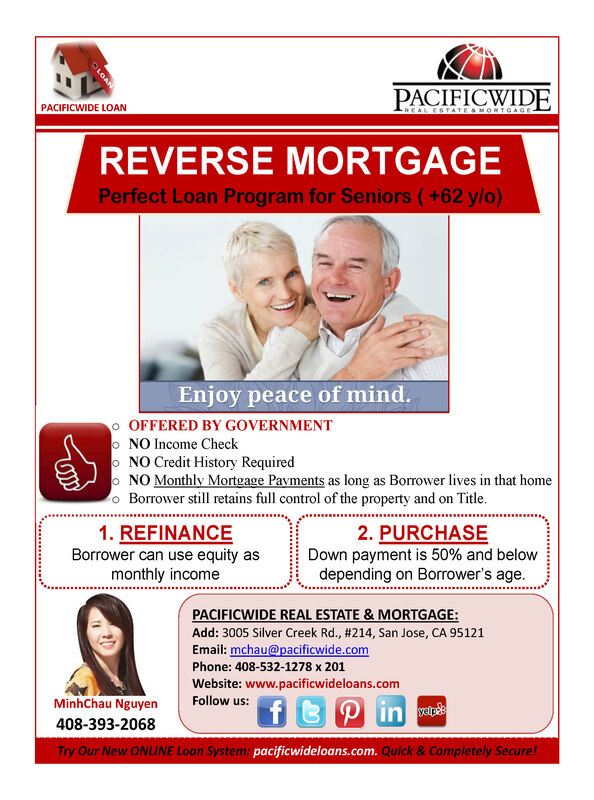 The funds from a reverse mortgage would first be used to pay off any existing mortgage(s). This would eliminate any monthly mortgage payments, which could free up money for other uses. Are there different reverse mortgage options to choose from? Yes. The HECM allows homeowners to borrow the maximum amount available to them through a reverse mortgage. HECM for Purchase can be used to buy a home that better fits your lifestyle. Fixed and adjustable interest rates are available. You can choose to receive your proceeds as a lump sum, monthly payment for a specified time period or as long as you live in the home, line of credit, or a combination of these. What fees and other costs are there? In addition to interest on the funds you receive, costs can include a property appraisal fee, origination fee, mortgage insurance premium, servicing fee, and closing costs that are similar to those for a traditional mortgage. Most of these costs can be paid out of loan proceeds. Your only out-of-pocket expenses are the appraisal fee and maybe a modest charge for HUD independent counseling (depending on the counseling organization you work with). What is included in the loan balance? When the loan becomes due, you or your estate must repay the lender for loan proceeds received plus accrued interest, any fees that were part of the loan, and accumulated mortgage insurance premium. You or your heirs choose how to repay the loan. It can be done by selling the property, refinancing or using other assets. Will there be anything left for my heirs? Each individual situation is different. If repayment of the loan is done by selling the home, any sale proceeds in excess of the loan balance belong to you or your heirs. If you sell the home for a fair market price that’s less than the loan balance, then there will be no sale proceeds to keep. But with a HECM reverse mortgage, you can never owe more than the value of your home at the time you or your heirs sell your home to repay your reverse mortgage. If my spouse passes away or can no longer live in the home, will I still receive benefits? Yes, as long as both spouses’ names are on the title of the property and they are listed as joint borrowers on the reverse mortgage application. In the event that one of the co-borrowers passes away or moves out of the home, the other borrower can continue to own and live in the home—and enjoy all the benefits of the reverse mortgage. Will a reverse mortgage affect regular Social Security or Medicare benefits? No. However, needs-based benefits such as Medicaid or Supplemental Security Income may be affected. Will I have to pay taxes on the proceeds I receive from a reverse mortgage? No. Currently the IRS treats monies received from a reverse mortgage as loan advances and not taxable income. However, we recommend that you consult with a tax advisor.